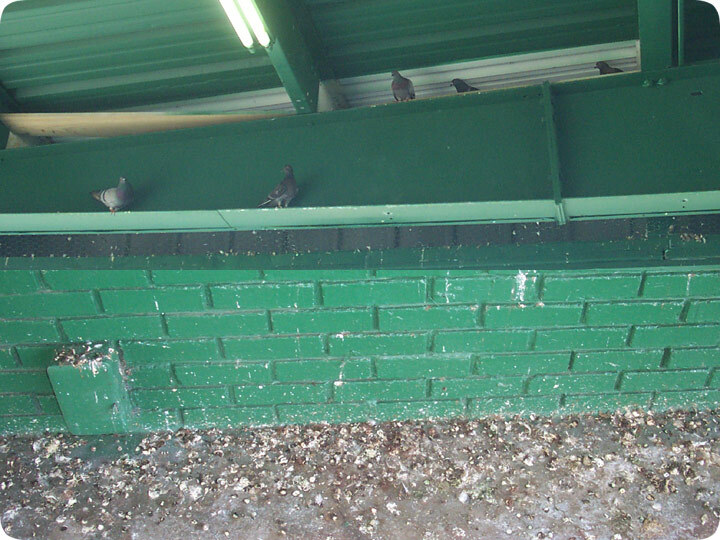 09.03.2006 - This is a typical example of a pigeon problem at an urban building. In this case, it was an auto repair shop in Orlando. I have split the photo into two parts - on the top is the area where the pigeons roost on steel beams below a metal roof. Below is the ground that is covered with pigeon droppings. The owners of the auto store clean the droppings often, but the birds keep making a fresh mess all the time. Pigeons are a common problem bird in Florida. Specifically, the urban pigeons that cause these problems are often called Feral Pigeons or Rock Pigeons, or even Rock Doves. Though Florida and many parts of the US have several species of pigeon, this is the city pigeon that causes problems with roosting and pooping. 1) Spikes: I proposed to install bird spikes on all of the beams to prevent the pigeons from landing and roosting. 2) Netting: I proposed to install bird netting below all of the beams to prevent access to the roosting areas. 3) Trapping: I proposed the temporary solution of trapping and removing birds to lessen the amount of bird pressure on the buildings, with trapping done on a periodic basis. The store did not accept any of these options, due to the high expense of pigeon control. They got some quotes from some other Florida Pigeon Control companies, but none could offer a solution in the store's budget range. Thus, they have to continue to deal with the birds and their droppings.